, an eminent English antiquary, was born in London, in the beginning of the sixteenth century, but in what parish or year is uncertain. He was bred at St. Paul’s school, under the famous William Lilly. 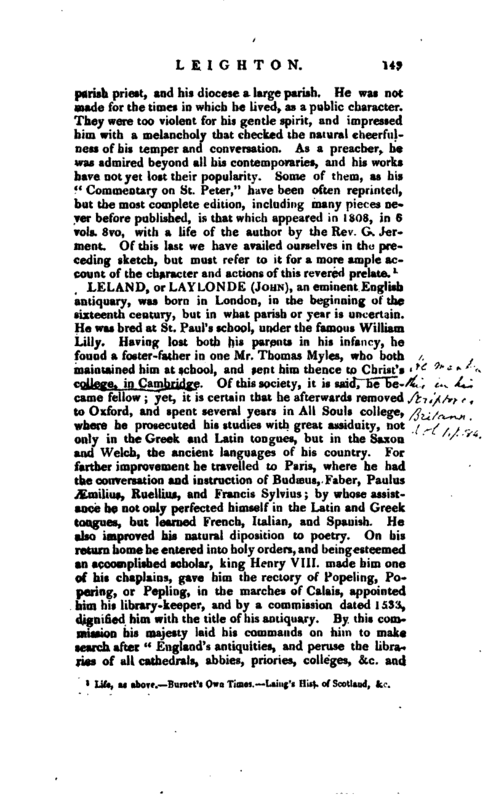 Having lost both his parents in his infancy, he found a foster-father in one Mr. Thomas Myles, who both maintained him at school, and sent him thence to Christ’s college, in Cambridge. Of this society, it is said, he became fellow; yet, it is certain that he afterwards removed to Oxford, and spent several years in All Souls college, where he prosecuted his studies with great assiduity, not only in the Greek and Latin tongues, but in the Saxon and Welch, the ancient languages of his country. For farther improvement he travelled to Paris, where he had the conversation and instruction of Budaeus, Faber, Paulus yEmilius, Ruellius, and Francis Sylvius; by whose assistance he not only perfected himself in the Latin and Greek tongues, but learned French, Italian, and Spanish. He also improved hia natural diposition to poetry, On his return home he entered into holy orders, and being esteemed an accomplished scholar, king Henry VIII. made him one of his chaplains, gave him the rectory of Popeling, Popering, or Pepling, in the marches of Calais, appointed him his library- keeper, and by a commission dated 1533, dignified him with the title of his antiquary. 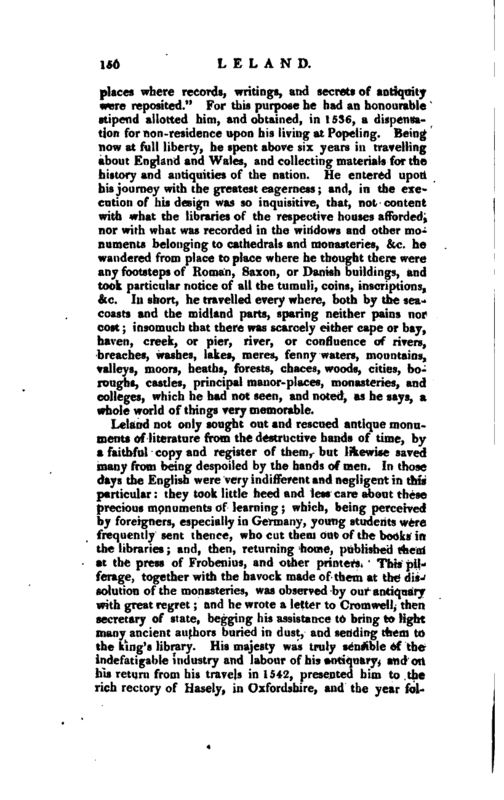 By this commission his majesty laid his commands on him to make search after “England’s antiquities, and peruse the libraries of all cathedrals, abbies, priories, colleges, &c. and | places where records, writings, and secrets of antiquity were reposited.” For this purpose he had an honourable stipend allotted him, and obtained, in 1536, a dispensation for non-residence upon his living at Popeling. 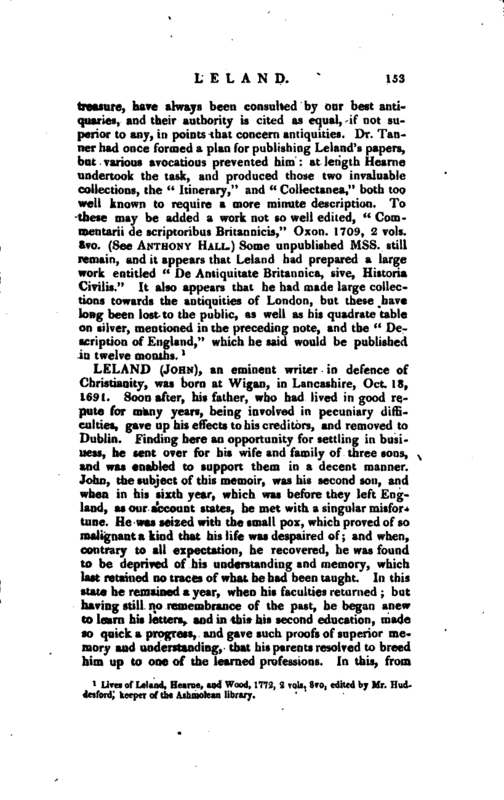 Being now at full liberty, he spent above six years in travelling about England and Wales, and collecting materials for the history and antiquities of the nation. He entered upon his journey with the greatest eagerness; and, in the execution of his design was so inquisitive, that, not content with what the libraries of the respective houses afforded, nor with what was recorded in the windows and other monuments belonging to cathedrals and monasteries, &c. he wandered from place to place where he thought there were any footsteps of Roman, Saxon, or Danish buildings, and took particular notice of all the tumuli, coins, inscriptions, &c. In short, he travelled every where, both by the seacoasts and the midland parts, sparing neither pains nor cost; insomuch that there was scarcely either cape or bay, haven, creek, or pier, river, or confluence of rivers, breaches, washes, lakes, meres, fenny waters, mountains, valleys, moors, heaths, forests, chaces, woods, cities, boroughs, castles, principal manor- places, monasteries, and colleges, which he had not seen, and noted, as he says, a whole world of things very memorable. Leland not only sought out and rescued antique monuments of literature from the destructive hands of time, by a faithful copy and register of them, but likewise saved many from being despoiled by the hands of men. In those days the English were very indifferent and negligent in this particular: they took little heed and less care about these precious monuments of learning; which, being perceived by foreigners, especially in Germany, young students were frequently sent thence, who cut them out of the books in the libraries; and, then, returning home, published therti at the press of Frobenius, and other printers. This pilferage, together with the havock made of them at the dissolution of the monasteries, was observed by our antiquary with great regret; and he wrote a letter to Cromwell, then secretary of state, begging his assistance to bring to light many ancient authors buried in dust, and sending them to the king’s library. 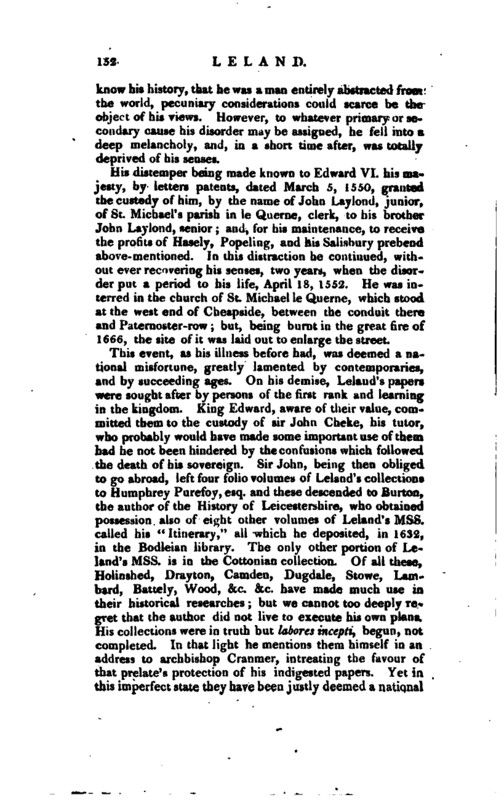 His majesty was truly sensible of the indefatigable industry and labour of his antiquary, and on his return from his travels in 1542, presented him to the rich rectory of Basely, in Oxfordshire, and the year | following gave him, by the name of John Leland, scholar, and king’s chaplain, a canonry of King’s college, now Christ Church, in Oxford; and, about the same time, the prebend of East and West Knowle, in the church of Sarum. In 1545 he lost the canonry of Christ Church, upon the surrendry of that college to the king, and had no pension allowed him in the lieu of it, as other canons had, yet as he is said to have been “otherwise prov ided for,” it was probably at this time that the prebend of East and West Knowle was given him. In 1545, having digested into four books that part of his collections which contains an account of the illustrious writers in the realm, with their lives and monuments of literature, he presented it to his majesty, under the title of “A Newe Year’s Gifte;” with a scheme of what he intended to do farther *. For that purpose he retired to a house of his own, in the parish of St Michael le Querne, London; where he spent near six years in digesting and bringing into form and order, the immense collections he had with so great assiduity amassed together. It appears by a letter of his published by Hearne, that he was desirous of procuring an able assistant, but we are not informed whether he succeeded. 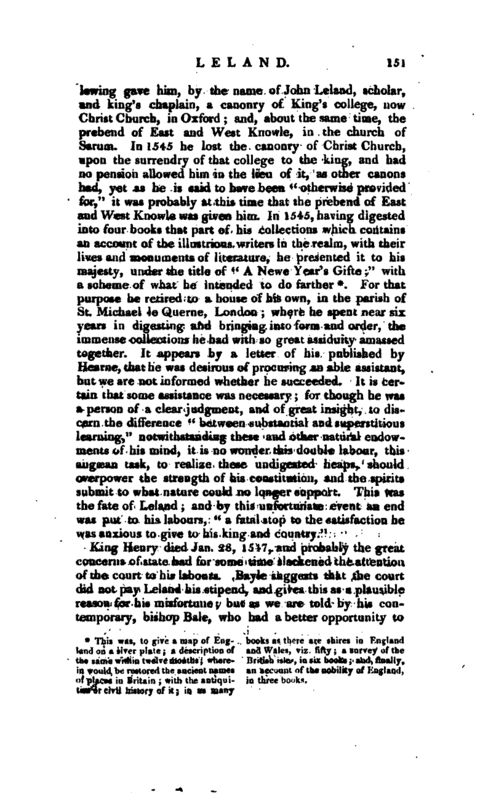 It is certain that some assistance was necessary; for though he was a person of a clear judgment, and of great insight, to discern the difference *' between substantial and superstitious learning,“notwithstanding these and other natural endowments of his mind, it is no wonder this double labour, this augaean task, to realize these undigested heaps, should overpower the strength of his constitution, and the spirits submit to what nature could no longer support. This was the fate of Leland; and by this unfortunate event an end was put to his labours,” a fatal stop to the satisfaction he was anxious to give to his king and country." of places in Britain with the antiqui- in three books, ties or civil history of it in as many | know his history, that he was a man entirely abstracted from the world, pecuniary considerations could scarce be the object of his views. However, to whatever primary or secondary cause ins disorder may be assigned, he fell into a deep melancholy, and, in a short time alter, was totally deprived of his senses. His distemper being made known to Edward VI. his majesty, by letters patents, dated March 5, 1550, granted the custody of him, by the name of John Lay I on d, junior, of St. Micuael’s parish in le Q aerne, clerk, to his hrother John Laylond, senior and, for his maintenance, to receive the profits of Hasely, Popeling, and his Salisbury prebend above-mentioned. In this distraction he continued) with* out ever recovering his senses, two years, when tue disorder put a period to his life, April 18, 1552. He was interred in the church of St. Michael le Querne, which stood at the west end of Cheapside, between the conduit there and Paternoster- row but, being burnt in the gri-at tire of 1666, the site of it was laid out to enlarge the street. Lives of —Leland,—Hearne, and Wood, 1772, 2 vols. 8vo, edited by Mr. Huddesford, keeper of the Ashmolean library.